Welcome to the Forecaster's Corner. 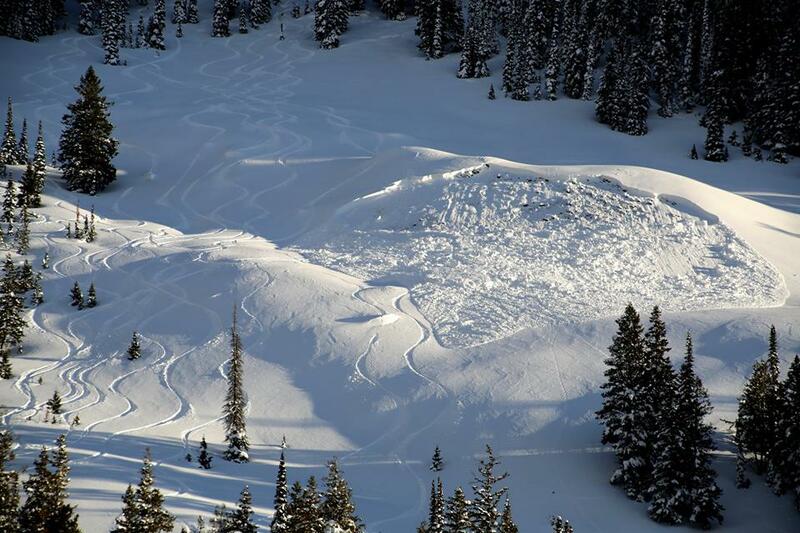 This is a place where Flathead Avalanche Forecasters and other avalanche professionals will contribute thoughts and musings on the current avalanche situation or avalanche stuff in general. Send us a note and tell us what you think at fac.admin@flatheadavalanche.org. How much did it snow? Estimating snow accumulation from your breakfast table. At the FAC, we forecast for the regional avalanche danger, but there are often variations to this danger at the basin scale. One of the big players for this variation is snow totals. The avalanche danger is often higher in areas that saw more snow. And yes, the powder is deeper too. Thus, from both avalanche safety and recreation perspectives, it is valuable to be able to read snow totals and to understand the nuances and potential errors associated with these instruments. We have a handful of SNOTEL sites and a number of other precipitation or snow depth sensors that we rely on for estimating snowfall during a storm. If you are looking at a standard SNOTEL site, there are 4 data outputs to consider: snow water equivalent (SWE), precipitation accumulation, snow depth, and air temperature. SWE and precipitation report on the same characteristic, but they are measured quite differently. SWE is measured from a snow pillow: imagine a scale – like one on which you weigh yourself at the gym or doctor’s office - placed underneath the snow. It measures the total weight of the snowpack, and just like the doctor, we can monitor how obese the snow is getting after a storm. This is my #1 most valuable tool for forecasting. Snow pillows record the change in mass during a storm, a value which doesn’t vary with air temperature, so they are the best measure of load produced by a storm. They report in inches of water equivalent – how much water would be in a glass if the snow were melted. The precipitation gauge also measures the water content falling from the sky, but instead of weighing the snowpack as it accumulates on the ground, it weighs the snow that falls into a bucket. Precipitation buckets have an anti-freeze solution in them so that snowfall melts upon arrival, and the gauge calculates how much water has been added with each storm. SWE and precipitation should align closely; if they don’t, there’s reason to be suspicious of the data. During exceptionally windy storms, the precipitation buckets can be less reliable because the snow isn’t falling straight down into the bucket. Occasionally the precipitation buckets get clogged by a cap of snow during big storms. However, the precipitation buckets can be useful in the early season for identifying rain events that could translate to snow at higher elevations, before the SWE snow pillow has developed. Furthermore, during spring melt, the SWE snow pillow can be losing weight as the snowpack drains concurrently with snow water accumulating at the surface - thus the precip bucket can be more effective for capturing accumulation. Finally, there is snow depth. In your yard, you can measure snow depth with a ruler, the same way a doctor measures your height with a yardstick. Automated weather stations rely on ultrasonic waves, the same way bats stay oriented when flying in the dark. The ultrasonic sensor is placed well above the snow surface and shoots an ultrasonic ping down at the snowpack. The time it takes for the signal to bounce back to the instrument is used to calculate the height of the snowpack above the ground. The change in height of the snowpack gives a measure of snowfall. For instance, if the snow height is 90 inches before the storm, and 96 inches after, at least six inches of snow accumulated during the storm. The snow depth – or height - reading is the most prone to data error or misinterpretation for a number of reasons. 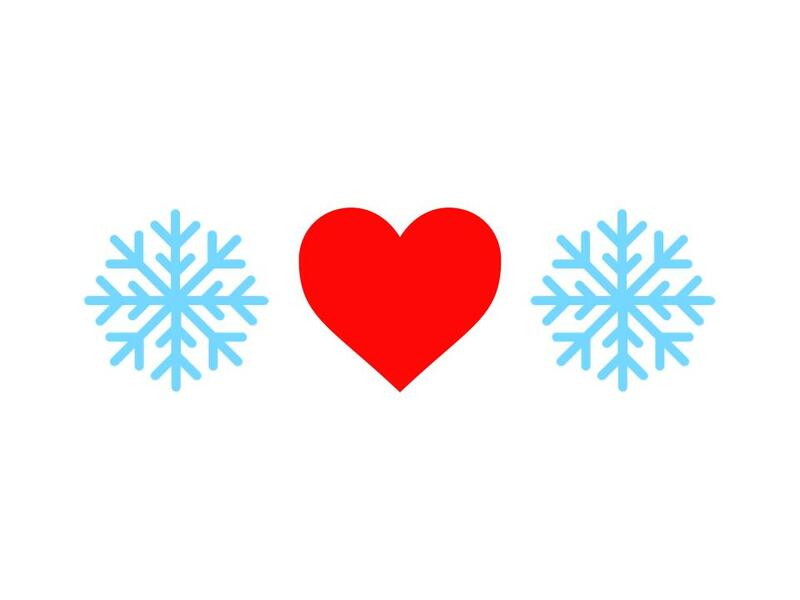 First, during heavy snowfall events, the ultrasonic wave might reflect off of snowflakes falling through the air, rather than the snow surface. You might see some unexpectedly big readouts which require common sense filters. Did the snow depth really increase 14 inches in one hour? Probably not. The other common source for misinterpretation is due to the snowpack settling (or shrinking in height) concurrently with the arrival of new snow. This effect is more pronounced during prolonged storms when the snowpack consists of feet upon feet of relatively low-density snow. In other words, the total snow depth might be five feet of fluffy snow, but with the arrival of another foot of snow, that existing five feet compresses to four feet deep as the new snow piles on top. So the snow depth doesn't change, even though it actually snowed a foot. If the existing snowpack is dense and has had plenty of time to settle, such as during the spring or after a long dry spell, the change in snow depth is a fairly reliable measure of new snow. During ongoing big snowfall events, I don’t trust the snow depth as a tool for calculating overnight snow totals. Instead, I look back to SWE and incorporate the 4th instrument, air temperature. During a “normal” snowfall event here in NW Montana (is there such a thing? ), snow falls somewhere in the neighborhood of 12:1 snow to water ratio, producing snow that ranges from 6% to 10% density. These ratios vary wildly with atmospheric conditions, air temperature, and the amount of wind damage that smashes snowflakes together as they fall. If you see air temperatures are in the mid 20’s during the storm, a general rule of thumb is to multiply SWE by 12 to get the amount of new snow. In other words, one inch of SWE means 12 inches of snow fell. If the snow accumulates with air temperatures in the 30’s, you are looking at ratios from 10:1 or 5:1. If the air temperature is 20 F or lower, ratios can be 15:1 or could reach beyond 30:1. This link has a conversion chart from NOAA, if you really want to geek out. Another source of error for all of these instruments is wind. SNOTEL sites are usually placed in areas that are well protected from winds, so they tend to be the most reliable during typical winds. We have snow sensors and precipitation buckets located in more wind-affected areas though, such as Big Mountain summit or above John F Stevens Canyon. It is important to consider wind drifting when looking at these sensors. Wind can either scour away new snow or drift it into misleading high totals. Some stations have wind sensors at or near the snow depth plot, but sometimes you have to infer the wind effects by looking at nearby wind sensors. The stronger the wind event, the less I trust the snow and SWE measurements. For a map of most of our local sensors, this is a great resource. Our favorite mountain SNOTELS are Stahl Peak in the Northern Whitefish Range, Flattop in Central GNP, and Noisy Basin in the Swan Range. Lower elevation SNOTELS such as Graves Creek, Emery Creek, and Pike Creek are also helpful. 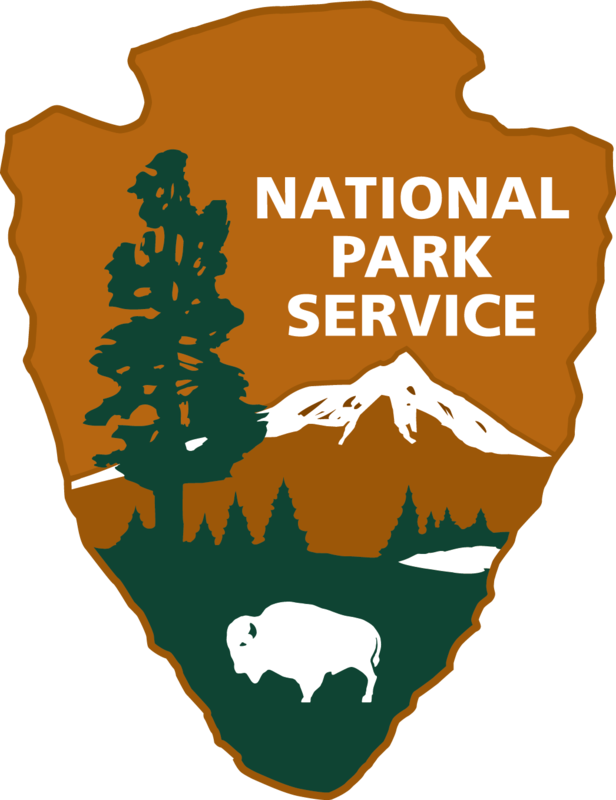 Other useful mountain stations include our Big Mountain Station (owned by FOFAC and maintained through a partnership with WMR ski patrol), several weather stations above and on the floor of John F. Stevens Canyons, and several sensors in Glacier Park operated by the USGS. A few of these stations are unlisted on our map but can be found here. FAC and FOFAC recently finalized funding and permitting to install a wind sensor on Mt. 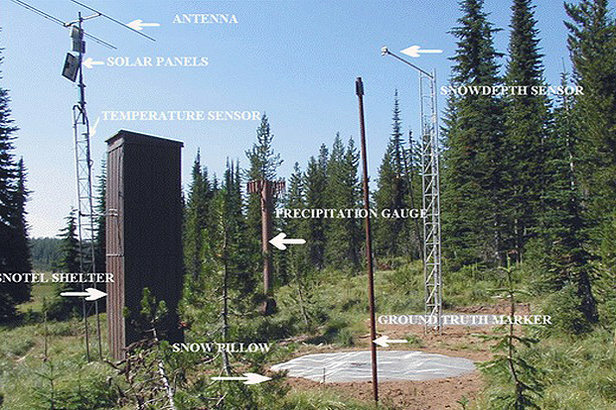 Aeneas, and we are working towards funding a weather station on Tunnel Ridge in the Middle Fork. Stay tuned for these exciting improvements! If you are traveling outside of our region, MesoWest is the most comprehensive source for looking at weather stations. The Story So Far - A Mid-January Snowpack Review. By Blase Reardon, FAC Lead Forecaster. It’s mid-January, and time for a review of the avalanche season so far. That can help us see patterns and alert us to upcoming problems. We’ll focus on upper elevations; at low elevations, the story is much simpler. Too warm! Too little snow! Too much bushwhacking! Like any good story, this review won’t be comprehensive. We’ll leave some details out, like your buddy does when he has everybody laughing about that time that….. And like you wish your uncle would, when he goes on and on and on. October snow at upper elevations made for a promising start to the season. It was followed by some dramatic weather events and drier conditions. Among the dramatic weather was a warm, late October storm that brought rain to over 7,000 feet. 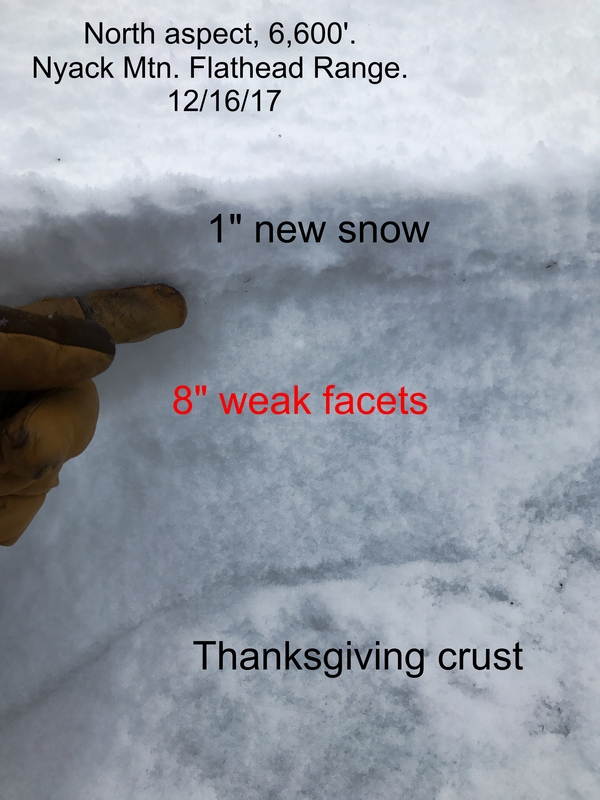 The ensuing crust was buried November 2 by a storm that brought dense snow that bonded well to the crust. It also pushed the Snow Water Equivalent (SWE) at upper-elevation stations above average. So far, no villain. Sadly, the pattern turned drier, which created weak layers at the snow surface. Snow buried this layer, followed by another warm storm that brought rain to about 5,700 feet. The mostly dry conditions prevailed until December 9, the end of this chapter. At that point, 7 to 10 inches of SWE had accumulated, and the snowpack at upper elevations had dropped to 80% of average. The villain? There were several candidates. In areas with shallower snowpacks, like John F. Stevens Canyon, weak, faceted snow had formed near the ground. Sun crusts had formed on slopes exposed to direct sun, with facets developing around those crusts and the early-November rain crust. But was the weak snow that existed at the surface on Dec. 9 that would prove to the most fragile. The winter turned markedly wetter about December 10, and helped the snowpack close the gap on average. Over the next month, until about January 10, a series of storms swept through the forecast area. The storms dropped 7 to 13 inches of SWE in a series of storms and small snowfall events. The pattern favored the northern part of the forecast region, with Flattop Mountain SNOTEL picking up nearly twice as much SWE as Noisy Basin. 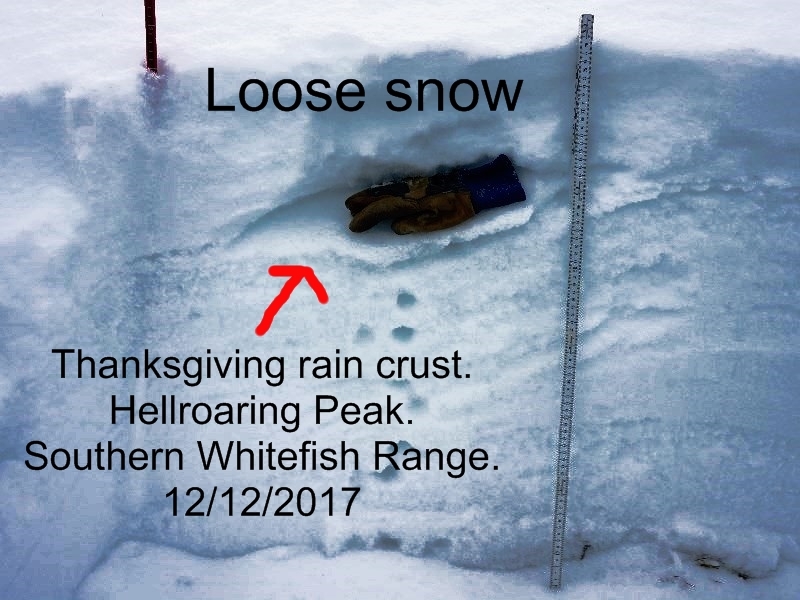 The last storm of this period, which ended January 9th, brought rain to higher terrain, though the exact elevation varied from 5,600 feet (Whitefish Range) to 6,800 feet (Lake McDonald area). The parade of storms didn’t allow for extended dry periods in which more weak layers could form near the surface of the snowpack. 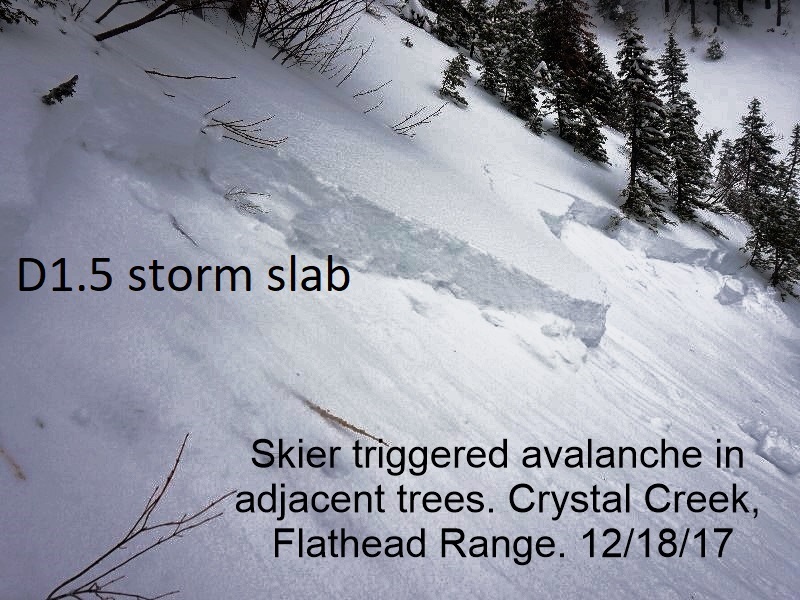 The primary avalanche problem during this chapter was initially storm slabs. These evolved into Persistent Slab avalanches failing on the weak layers formed during the season’s first chapter. 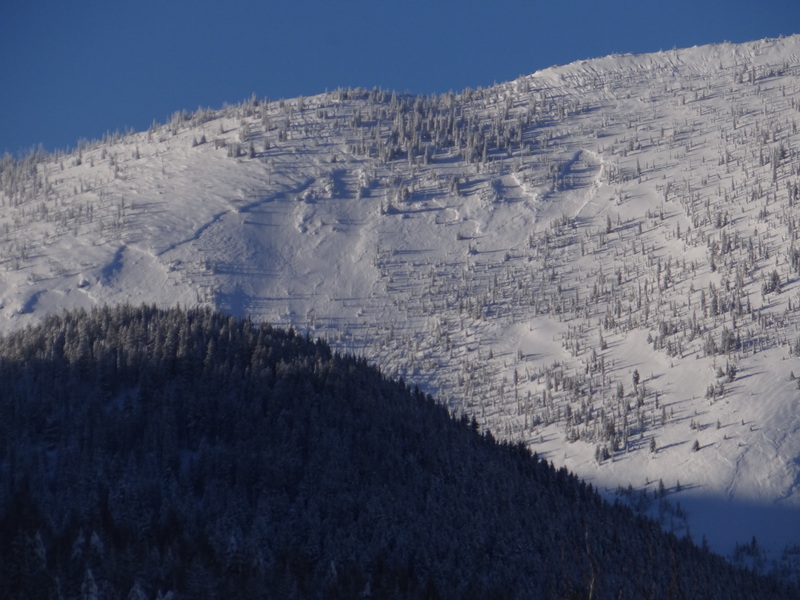 In the Whitefish Range, a widespread cycle of natural avalanches ran with the first storm in December. Later cycles seemed concentrated in the Middle Fork corridor. And they seemed to grow in size with each storm, even as the number of observed slides diminished. People reported several crowns over a thousand feet wide. And around January 9, a very large avalanche ran near Essex; it swept over an alpine lake, left debris 10-15 feet deep, and likely failed on weak snow that was on the snow surface in early December. Nonetheless, the avalanche danger was diminishing. By January 10, the fragile snow near the ground had strengthened except on upper-elevation slopes with thin snow cover. The December 9 interface had adjusted to the meter-thick slab consolidating above it. The villain was cornered in the highest, most alpine terrain. While the previous chapters lasted one to two months, this chapter comprises just a week, January 11 to 17. Sometimes a short chapter is all it takes to set up trouble ahead. In this brief chapter, the dominant weather was high pressure that brought inversions to the region. For nearly a week, clouds seem to hand just above the valley floor. Above the clouds were blue skies. Over this week-long period of stagnant weather, multiple weak layers developed at or near the surface of the snowpack. Facets developed in the soft snow above the rain crust left by the January 9 storm. The clouds provided a moisture source for a bathtub ring of surface hoar at mid and upper elevations. Where the air was drier, the low-density snow at the snow surface faceted. Clowns to the left of me, jokers to the right. And below. And above. Even Bruce Lee might be in trouble. And that’s where we’re at on the morning of Thursday, January 17. Another chapter is starting. Snow is forecast for the next few days, and that snow will bury these weak layers. How they’ll react depends on the rate and amount of snowfall, but it’s pretty clear that in the next chapter, these layers will be our primary concern. Oh, and those basal weak layers may crawl out from under the bed and cause more trouble. We are all on the edge of our seats waiting for a big storm...but unfortunately, it looks like another dry week ahead. A ridge of high pressure is moving onshore by Wednesday and will be parked over the Pacific NW for almost a week. These extended droughts can spell trouble for the snowpack. The clear skies and cold nights drive strong temperature gradients, especially when the snowpack is shallow and close to the warm ground. As we have already seen, facets grow larger and weaker with each day of clear weather. Surface hoar growth usually accompanies these high-pressure systems, making for an ugly "buffet" of weak layers. 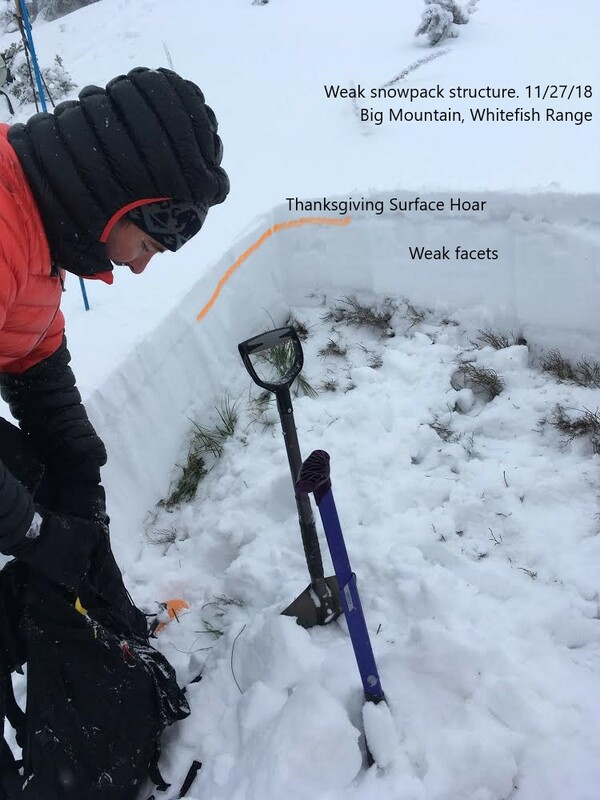 In many ways, our snowpack structure is shaping up to look a lot like last year's foundation, which resulted in a challenging persistent and deep persistent slab season and numerous major avalanche cycles. (See blog post #6 below). The key ingredient missing right now is a snow load. Right now we are holding off on daily forecasts because the snowpack is thin and generally stable, with only small and isolated instabilities in high terrain. We will start issuing daily forecasts when the snowpack becomes more favorable for winter travel and when avalanche conditions become more dangerous. So when will it snow? Looking ahead at ensemble forecasts, we can see a trough developing over the Pacific Coast around December 10, and moving onshore over the next couple of days. We are still too far off to say anything with confidence yet, and often the models are overly optimistic about breaking down high-pressure ridges. However, NOAA's 8 to 14-day outlook shows above-average precipitation and temperatures, consistent with the warm and moist southwest flow at the leading edge of a Pacific trough. Our fingers are crossed! 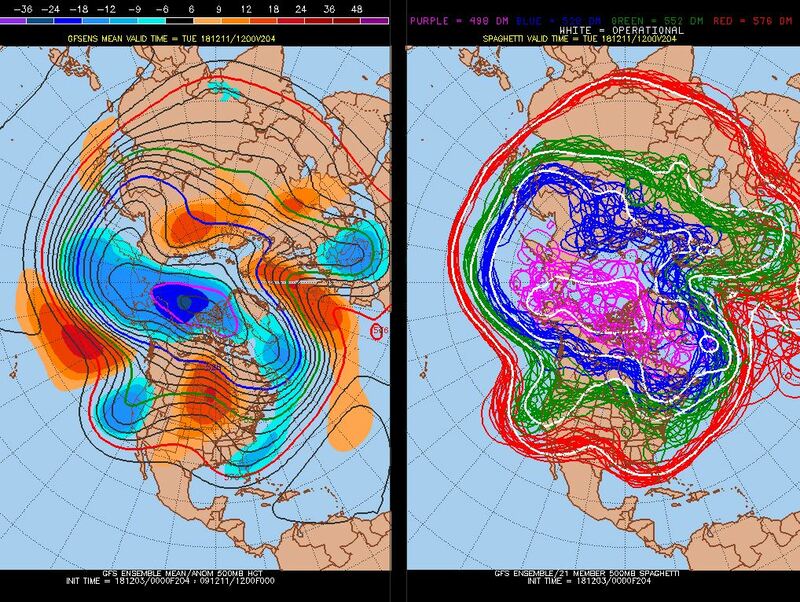 The spaghetti string plot above shows an ensemble of GFS models for December 11. Although the placement and characteristics vary, most models agree on a deepening trough somewhere along the Pacific NW Coast, which is often associated with good precip for us. The graphic below shows NOAA's prediction of above-average precipitation for the Dec 11 to Dec 17 timeframe. In the meantime, we're still paying close attention to the weather, publishing snowpack updates as needed, and tracking all of those weak layers that are forming during our dry early season weather. We have two new forecasters that I'm excited to have on the team: Clancy Nelson and Blase Reardon. I've had the opportunity to forecast with Blase in the Central Mountains of Colorado and I've been working with Clancy for a few weeks since he moved from the Sierra's, and I'm excited about the skill set and talent that both of these forecasters will bring to the center. You can read more about all of the staff on our bio page. No other major changes to announce for the center this year, but here are a few updates. We are working through permitting and funding hurdles for a weather station in the Middle Fork and a wind station on Mt. Aeneas with the goal of having these in place by the fall of 2019. We are collaborating with a few other avalanche centers to develop a mobile app for getting forecasts, sharing observations, and more. We have an improved weather station map and table coming out shortly. You may also notice that we changed the "upper elevation" zone from >6,000' to >6,500'. We felt this better reflected the effects of increased wind and precip that often occurs in the alpine. We are making a few changes to our weather forecast tables to make them more digestible and useful for the public. We also updated our "How to Read The Forecast" page. Even if you are a regular visitor to the forecasts, you should take a look at this page because it defines what we mean by some of those vague terms like "possible" or "large" or "likely". 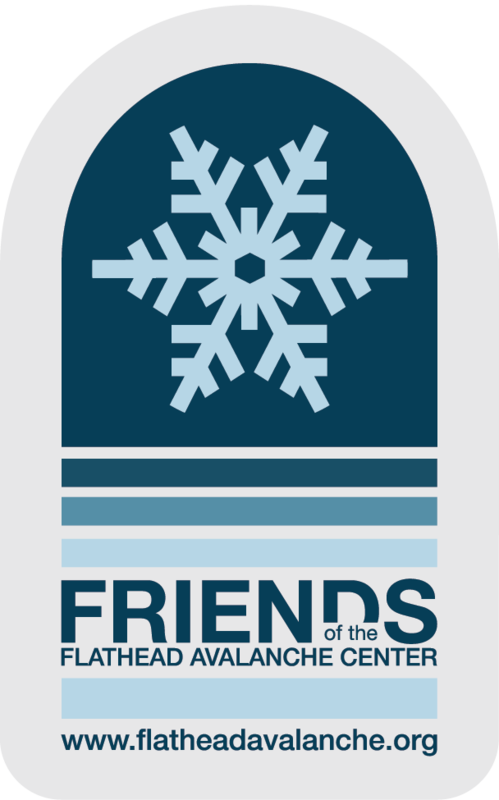 Here's a huge preemptive thank you for all the volunteers, sponsors, FOFAC members, forecasters, and staff members who pour their time and energy into making our center what it is. We are ready for action...let it snow! If your personal backcountry goal is an awesome journey punctuated by a safe return home, then you’re probably more concerned with how to mitigate the last few heuristic traps discussed in this series than with their mechanics and origins. Really, no matter how much we blog and tweet and post about making good decisions, we’re still going to make human factor mistakes. 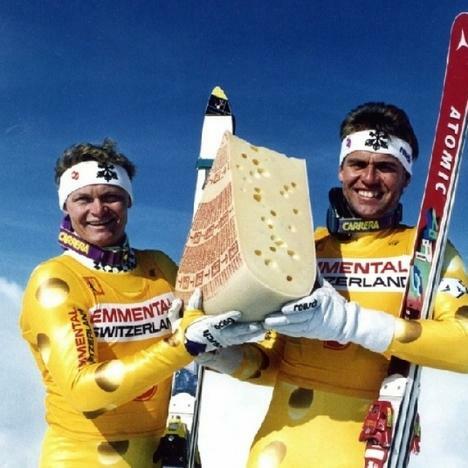 May we present for your consideration: swiss cheese. 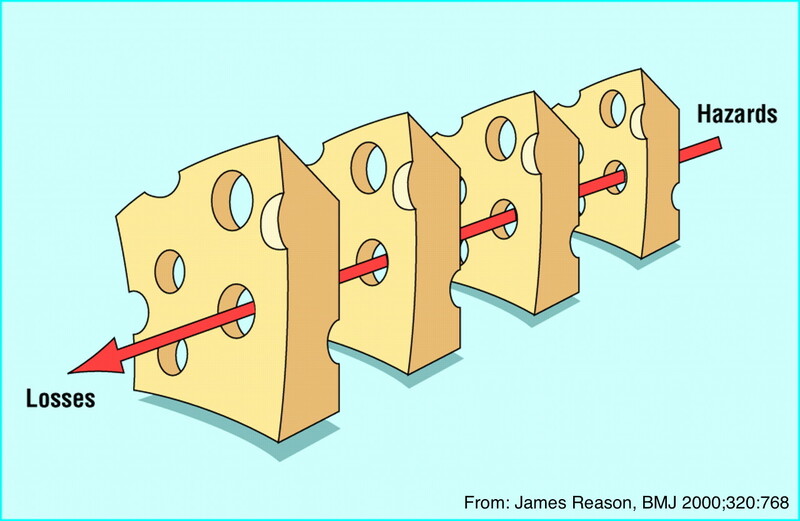 British psychologist James Reason uses the “Swiss Cheese” model as a systematic method for reducing negative outcomes that result from a series of human errors. Reason is mostly thinking about risk management in aviation and healthcare fields. He compares achieving a goal to a lineup of swiss cheese slices, with each slice representing a defense against an unwanted outcome, and with the holes representing all the ways our fallible human selves could go wrong. If too many holes, or errors, align amidst the cheese stack, the result will be an accident. When applied to the concept of time in the backcountry, Reason’s cheese holes start to look a lot like the human hazards of terrain familiarity, peer pressure, confirmation bias, etc. Some of those holes can also represent factors outside your control, like snowpack and terrain features. The more slices you stack up, the less likely that a series of backcountry decisions and conditions will result in an accident. Your personal process might include different tactics, but here are a few cheesy suggestions to help develop a system of lactic defense for your backcountry outings. Feel free to be selective about your group. When it comes to traveling in avy terrain, it’s wholly acceptable to have friends with whom you don’t ride or tour. Meet up with them afterward at the bar. Choose team members who practice with their safety equipment, who listen to input from the group, and who demonstrate their own systematic approach to decision making. Leave your itinerary with someone reliable and plan to check in with them at the end of the day. Not only is this directly relevant to your safe return home, it checks and balances your thought process. If you feel squirrelly about leaving a route with your mom, you probably have no business traveling there. Try not to overcommit, whether it’s to a route or a group. Feel free to excuse yourself from an invitation if your schedule’s packed or you’re low on steam for the week. Overextending yourself leads to lack of preparation and makes for more holes in the cheese. Besides, no one wants to be that twerp with a yard sale at the trailhead, looking for a fresh battery for their beacon. Human failure is inevitable. Our irrational selves are going to let us down perennially. You don’t have to use the techniques suggested above, but go ahead and set up as many precautionary roadblocks as you need to protect yourself against your own irrationality. Even as we transition toward springier travel conditions, keep in mind that all of your defenses are still useful, and will continue to be relevant even after you stash your sleds or skis for the season. And when you’re packing that sandwich for the trail, don’t forget to lay the cheese on thick. Anyone with a grandmother knows the danger of watching all your friends jump off a bridge. They might convince you to jump too. Here in northwestern Montana, there are metaphorical bridges lurking in all our powder stashes if we rephrase the question. For instance, if everyone else skied off that rollover, would you do it too? If, according to the interwebs, Eric Peitzch skied Rescue Creek yesterday, should you do it too? As social critters, we’re inherently susceptible to crowd-sourced wisdom, but this wisdom can really hamper our individual decision making in the backcountry. Reach back to your time in Avy 1 class and recall that the S in the FACETS stands for the proverbial bridge jumping decision. It’s “Social Facilitation” or what psychologists also call social proof. When we see our friends high mark a slope, or watch someone ski an edgy line, we’re inclined to use social proof to justify our own participation in the fun. It’s our tendency to see an action as more appropriate when our neighbors are doing it. We’re tribal beings, and we take cues from those around us. The A in FACETS is also at play here. Recall that “Acceptance” describes our tendency to seek validation from our crew. Rather than raise a dissenting opinion in our group and ostracize ourselves, our quest for acceptance makes us act in a way that ensures we’ll get invited along on the next trip. Simply put, it’s peer pressure. In tandem, the combined influence of social proof and peer pressure has a powerful impact on our decision-making ability. It might, for instance, create an urge for us to drop right off the cornice with the rest of the powder lemmings. As many experts have pointed out, social media amplifies both of these factors by allowing us to bring our whole tribe into the backcountry in the form of a smartphone. Instead of just seeking approval from our touring mates, we’re now looking for it from all of our online followers and friends. Social media outlets allow us to gather input from a broader crowd than the people in our immediate presence. We might be tempted to make our tour plans based photos of places and lines that everyone else posted recently (or even based on their snowpack observations on the FAC page!). One member of our tribe shares the illustrative story of his time at a backcountry yurt a few springs ago. On the first day of the trip, his band of strangers proceeded to suss each other out and get to know the local snowpack by digging pits, acknowledging heuristic traps, and percolating out into subgroups. Although they observed a few layers of concern and signs of instability, our protagonist decided to attempt a back flip he’d been eying all afternoon. The light was just right for a photo and the crew’s attitude was lighthearted and playful. His landing impacted a layer of buried surface hoar and triggered the deep slab avalanche pictured above, out of which he was lucky enough to ski. The incident is a weighty example of just how much the extended sense of social proof and peer pressure can cloud our reasoning. How are you going to combat your tribal instincts? Ideally, you might want to go out only with your friends who own flip phones, or with ancient telemark skiers who are impervious to the perils of social media. Pragmatically though, it’s best to fall back on a systematic process for decision making. Instead of making choices based on a whimsical social media post, rely more on your personal checklists and an evidence-based evaluation of the snowpack. Ask your group about their intentions for the day. Is that the safest line, or is it the one that would look great on your online profile? Make a practice of examining your motive every time you snap a pic. It’s a dynamic atmosphere when we can consult with skier colleagues across our community in real time, whether by liking their posts, combing their snowpack observations, or just catching up in person at the coffee shop before heading out for the day. Here’s to all of you autonomous mavericks though, maintaining your tribal membership while you set your own skin track! Editor's note: For another great read relating social media to avalanche accidents, check out this article. For Part 1 of the Human Factor Series, scroll on. Who among us hasn’t been stuck at the dinner table with their proverbial Uncle Bill, circling around the same argument we have annually about the same hot-button topic, neither willing to budge in our unwavering opinions? No matter how much evidence we politely present to the other, we both head home unfazed. Psychologists have a painfully straightforward explanation for this charade, and it’s surprisingly relevant to the way we make decisions in the backcountry. The expert term for our entrenched viewpoints is confirmation bias. It’s our tendency to interpret new information in favor of our already existing assumptions and to disregard input that might challenge those assumptions. Confirmation bias is a mental shortcut that helps us make quick decisions in stressful situations. Processing information that’s contrary to our belief requires more energy than processing that which reinforces it. We’re wired to sift through excess noise and retain the stuff that supports our value set, while we chuck contradicting data to the curb. This proclivity might have served our prehistoric ancestors well in making quick and simple decisions, but it often works against our Gortex-clad pow-seeking selves. In order to critically evaluate the snowpack and make a safe call, we need to observe and process all the data, not just the bits that support our assumptions. Luckily, there are plenty of techniques we can use in the field to counteract our powder-piggish traitor minds. Although it might sometimes feel like mental gymnastics, make yourself search for what you’re not expecting to see. Psychologists like to say, “Practice makes.” Not that practice makes perfect, but that by doing the thing, we do the thing. The more we practice combating our bias, the more we’ll do it reflexively. Practice it while you scan the avalanche advisory. Are you reading “10-12 inches overnight,” or do you hone in on “storm slab instabilities?” Practice it in the skin track. Check in with your ski partners about their assumptions for the day and ask what the opposite of those assumptions might be. Practice it in your snowpit. Are you hoping for a few non-propagating ECTs to reinforce your plans to center-punch a sweet line, or are you looking for a reason to bail toward more conservative terrain choices? Instead of seeking data to confirm your hypotheses, try your darndest to disprove them. If your group is feeling really nerdy, assign someone to be “devil’s advocate” for the day. Make it their job to disagree with everyone’s assessments. Not only will this help the designated contrarian examine their personal assumptions, it will also slow the momentum of the whole group’s confirmation bias. Most importantly, call each other out. Don’t be afraid to compassionately ask your pals to state their case. Peer pressure can be our most powerful tool in mitigating our bias. We’re going to think more critically if we know our crew is holding us accountable. 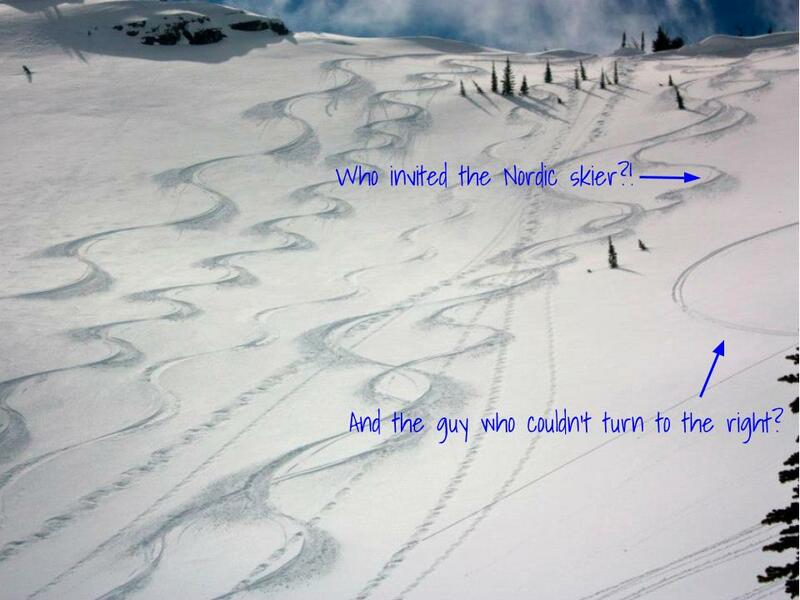 Keep checking your confirmation bias throughout the ski season. Who knows? Maybe you’ll find you have a little more in common with Uncle Bill this year at Thanksgiving than you expected. Deep slabs aren't a problem that we are used to dealing with every winter. Because they are so challenging to assess and have huge consequences, we spend a lot of time worrying about them. Here is a look at some of our data. I created a map of reported deep slab avalanches since we started describing the Thanksgiving Crust as a deep slab problem in our forecasts. You can click on each pin for photos of each slide. There are a lot of caveats with this data; Our samples are biased by the the places that we frequent the most or have better views of. That being said, there are some patterns worth considering. Deep slabs have been failing at upper elevations and more commonly on leeward or sheltered aspects. 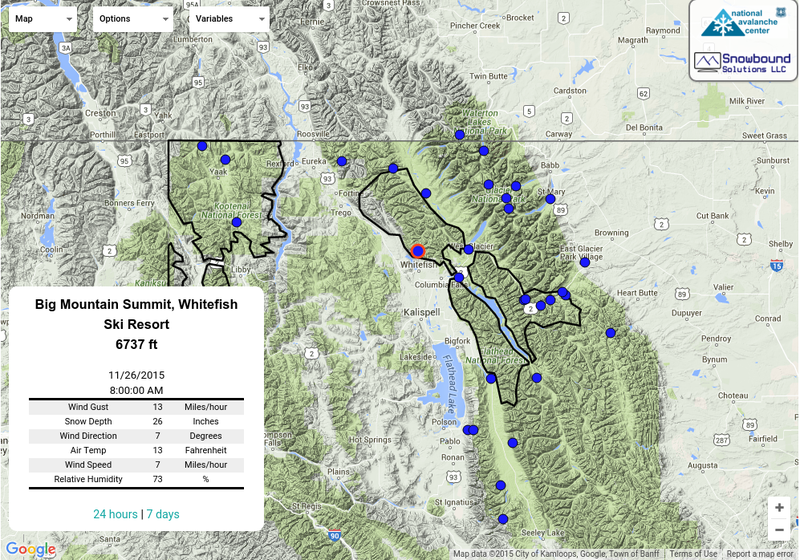 The Flathead Range has been most reactive, while the Swan Range has been the least reactive. The timing of naturals has been most commonly during warm and wet loading periods, especially the tail end. Take a photo and let us know if you see a deep slab. Our data is so limited that any bit helps. We'll periodically update this map as more observations come in. **Note** This elevation rose is different than the one we use in our advisories. I zoomed in on the mid and upper elevation bands to add additional detail. Note the three rings are 5,000', 6,000', and 7,000'. We use avalanche problems in our advisories to help backcountry users identify avalanche concerns and make appropriate terrain choices. Avalanche problems were born from the idea that not all days are equal, even if the danger rating is the same. For instance, the danger might be rated Considerable and we anticipate numerous small natural avalanches that are easy to recognize and avoid. Another day, the danger might be Considerable and we are expecting only a few avalanches, but they will be very large and destructive. On those two very different days with the same danger rating, I will travel through the terrain differently and be on the lookout for different warning signs. This page has a great video about avalanche problems and describes the 9 problems that we use. Oftentimes, there is overlap between problems, but we do our best to fit a variable snowpack into a few meaningful problems and travel advice in a way that is most useful and digestible for our users. This season has provided a rare and perfect example of the evolution of avalanche problems from a single weak layer that was born in December. This layer has become infamous and deadly across the entire Western U.S., and it has gained the nickname the DDL (December Dry Layer). Recall back to early December, when there was widespread despair over the lack of snow in our valley and across the West. It had rained extensively to the mountain tops here (leaving our Thanksgiving Crust), and snowed just enough to leave some low density snow on that crust or on the ground. That snow quickly rotted away during the subsequent weeks of cold, dry weather as we all started burning our snow gear or performing weird snow dances to appease Ullr. The avalanche danger was low and we were only concerned about small, loose snow avalanches entraining this weak and cohesionless layer. I'll provide a time lapse of photos from the Whitefish Range (on the left side) and the Flathead Range (on the right side) to highlight the evolution of the DDL. Our first storm produced a very widespread cycle on these weak layers. More so in areas that saw more snow. It was a classic storm slab instability that was easy to predict and recognize. We saw heavy snowfall, plenty of signs of instability like shooting cracks or other avalanches. The slabs were soft, relatively shallow and generally behaved in predictable manner. We could easily gather evidence from small test slopes, shear tests, etc. The next storm came in quickly and resulted in another round of widespread avalanching. However, the rapid load seemed to mostly shed off in the new snow layers, and we didn't observe nearly as many slides breaking on the DDL. By this time, we were calling failures on the DDL persistent slabs: the weak layer was persisting under a thicker and more cohesive slab now, and it was producing larger avalanches, up to D3 in bigger terrain. It didn't produce widespread signs of instability like the first storm, but we would get occasional feedback. Some collapses and shooting cracks, or propagating results in stability tests, which all began to wane in the week after the storm. There were some slopes that didn't have the right ingredients (the slabs had flushed, the weak layer wasn't there, or both), and these were the safest slopes to go to if we wanted to ski or ride in steep terrain to allow a buffer for the trickier and less predictable behavior. Areas with deeper snowpacks were healing quicker, such as the Swan Range. During our last storm cycle which ended last weekend, the problem grew even larger, and evidence became hard to find. We went an entire week of continued snowfall with very limited feedback (no large avalanches reported, one collapse observed, and mixed results from stability tests which were pointing more and more towards improved stability). When the storm cleared, we set eyes on 8 avalanches that broke down to this layer (and there were undoubtedly more). Although we didn't see widespread activity, the sizes were even larger, from D3 to D4, and we measured one crown to be at least 7 feet deep. These slides were easily large enough to destroy vehicles. This cycle peaked during a very rapid and warm loading event at the tail of the storm. We are now in the deep slab phase. Signs of instability will be rare or nonexistent. Spatial variability of the DDL is challenging and the reliability of single point assessments on deeply buried weak layers is highly unreliable. We may go days (or weeks?) without any avalanches on the this layer, and then whammo...we will see something go in a very big and destructive way. Or maybe we won't. Deep slabs are fickle and the single most challenging problem for forecasters and recreators alike, because they give such poor feedback but carry such dire consequences. Our best strategies for these beasts is to avoid the terrain that makes us worried. In this case, our data suggests the problem has shifted to higher terrain. Deep slabs tend to occur during big warmups and big loading events, so use extra caution, even in runout zones, during volatile weather. However, they can be human triggered well after the storm is over. Staying away from shallow points and rocky areas helps improves your odds, but these trigger points can be concealed and impossible to see before the avalanche pulls out and reveals them. Of course we have more problems on the list now, such as a surface hoar/ faceted rain crust that was buried a few weeks ago (our newest generation of persistent slab), and now another layer of crusts and surface hoar buried today (our newest generation of storm slabs) We may phase out deep slab problems during periods of benign weather or if other problems are significantly more active and threatening. That being said, it will be hard to rule this problem out completely and there will always be some forecaster uncertainty around it because it is such a challenging problem to assess. 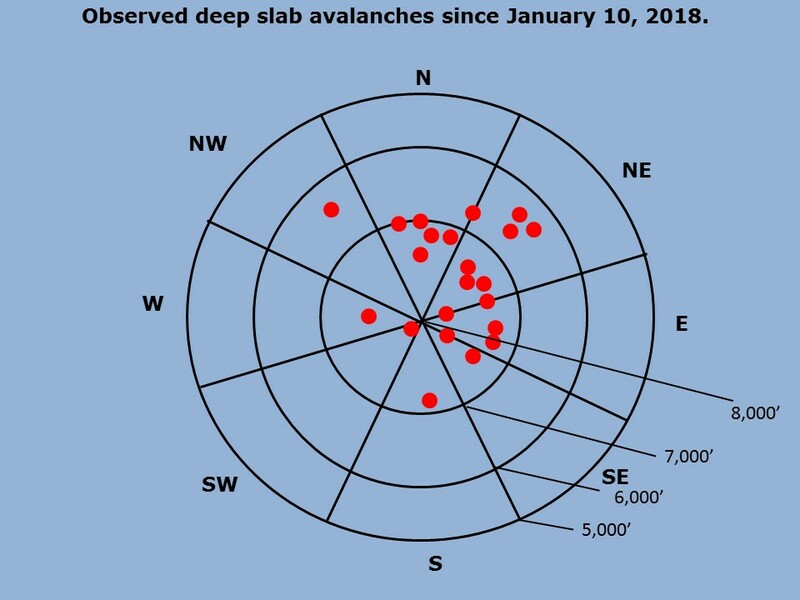 The graph below depicts all of the slab avalanche activity recorded in our database from this season since the DDL was buried. 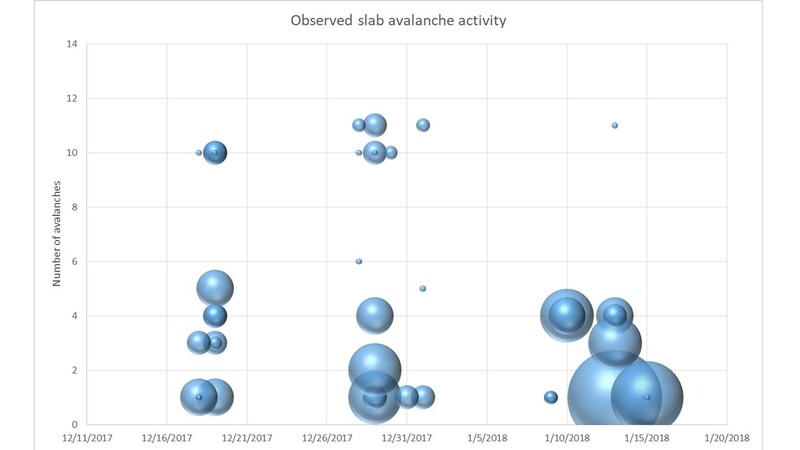 The size of the bubble demonstrates the destructive size of the avalanche (the smallest=D1, the largest=D4), while the vertical axis shows the number of avalanches for that given size on a given day. You can see a higher frequency but smaller avalanches from the first two cycles, and fewer but far more destructive avalanches from the last cycle. Remarkably, there have been very few avalanches triggered during the weather lulls between avalanche cycles. This is not commonly the case for persistent weak layers (and hasn't been the case for Canada or other areas in the Western U.S.) I think this speaks volumes to the patience and smart terrain choices of our backcountry users here. The dust is finally settling from our last two significant storms and avalanche cycles, and I’ve been wanting to highlight and explain a few changes to our website this year. We made these changes in an effort to improve our products for the wide range of users in this valley. We have a multi-tiered observation form to encourage quick summaries as well as more thorough observations. Your observations are essential to our forecasts, so we want to make the process as painless as possible. The “Quick Observation” tab just asks for your contact info, location, and a a quick text summary, with the option to upload photos or videos. There are additional tabs for our those of us who want to add specific details on our route, snowpack, weather, or avalanche observations. Hopefully this multi-tiered is easier to digest for all of our audiences and will encourage more public observations to help with the accuracy of our products. You can always email us, or call/text us 406-66AvyOb too. 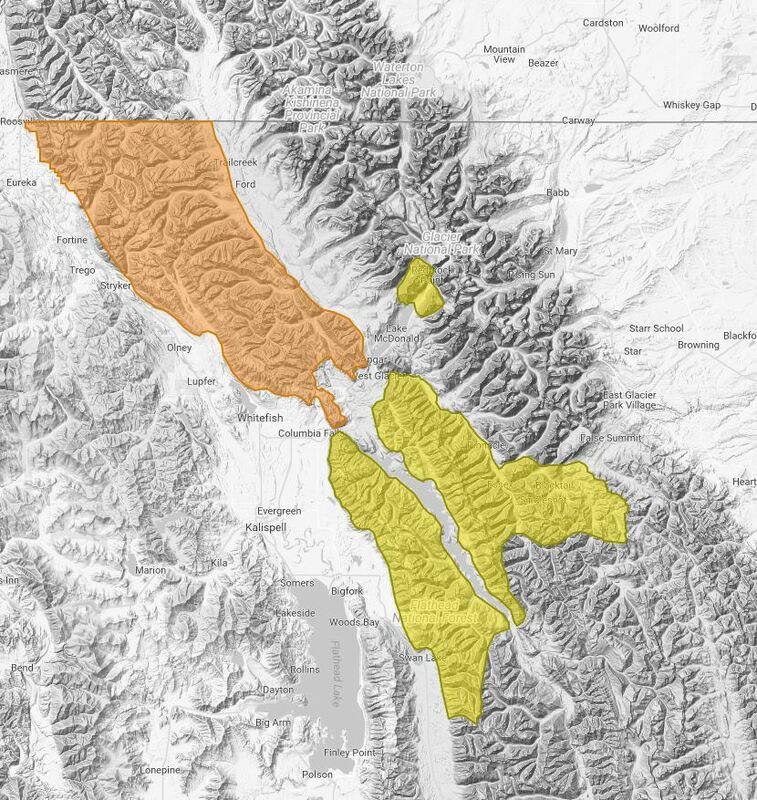 On the advisory pages, we have added a slide show below each avalanche problem that is intended to help further your understanding of the problem. Our forecasters choose the most relevant photos each morning. They may not be chronological or recent photos, but rather, the best photos to demonstrate what the avalanche problem might look like or how to identify it in the field. Our job as forecasters is to synthesize a large amount of data from observations, weather stations, and weather forecasts into a product that you can understand, retain, and use to make educated decisions in the backcountry. To prevent information overload, we removed the “Recent Observations” and “Current Conditions” tables from the advisory page. Instead, we are highlighting the most relevant and critical observations into our technical discussion and problem description. For instance, if we receive 5 new observations with all sorts of pit data, we will do our best to summarize what is most relevant to the day’s problems and provide hyperlinks to essential observations or photos. If new snowfall is a key player in today's problems, we will highlight where and how much snow fell. All of this observational data is still available on our website through our observations page and weather station map and table, and we encourage you to gather this supplemental information before heading out. As our snowpack evolves, we may highlight significant differences between the different mountain ranges by publishing separate advisories for each mountain range. In general, our technical snowpack discussion will be the same across all ranges, but the danger rating and avalanche problems (avalanche character, size, likelihood, and distribution) may be different. We want to provide as accurate and useful information as possible within the scope of our resources. Make sure you check the avalanche advisory for the area that you plan to recreate, and know that there may be differences between the 3 mountain ranges. Our email subscribers will receive separate emails for each mountain range on those days that we publish separate advisories. Editor's note: Zachtern has yet to bring us an actual cup of coffee, but he did bring doughnuts to a meeting once. Zach is extrememly motivated and skilled and we are grateful for his time. Thanks, Zach! Winter has turned back on in the Flathead Valley over the past week. The last storm system laid down over to 30 inches of fresh snow on top of a rain crust that formed February 10, and the skiing/riding has been phenomenal! Having had the chance to rebuff your deep powder skills over the past few days rounds out a great season’s worth of backcountry skills maintenance and improvement, right? All winter long we’ve been out playing in the snow, skiing, boarding, , riding, digging pits, analyzing weather, improving group communication, working on terrain recognition, submitting observations, and all sorts of other skills. As the season progressed, each of these skills has seen its fair share of focused energy and each of these facets of backcountry travel has further developed. But what about your companion rescue skills? When was the last time you ran through a beacon practice? How recently have you whipped out your probe and assembled your shovel? Quickly? With gloves on? Have you practiced strategic shovelling with your backcountry partners in case of an emergency? How’s your medical kit looking? Perhaps it’s emptied of ibuprofen from long days in boots or from a tweaked back from too much sidehilling. If you’re left questioning any of these skills, now is a good time to dig back in and refresh for your own sake, and that of your partners. Let’s break companion rescue down into a few simple steps and discuss each with ideas for training. Immediately after an avalanche, the first thing remaining group members need to do is decide whether or not the avalanche path and deposition zones are safe to enter. 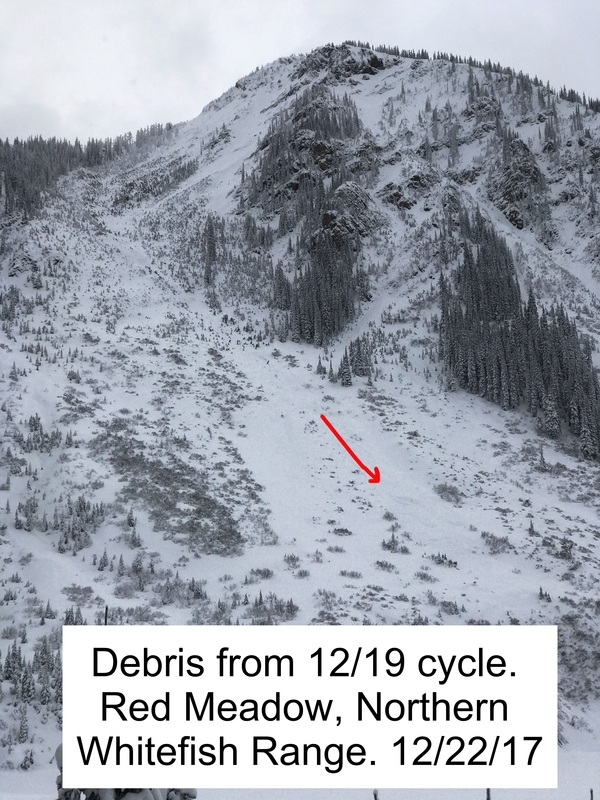 Be aware of hang-fire (the snow adjacent to an existing fracture line that remains after an avalanche release), adjacent and connected avalanche paths, runout-zones of other avalanche paths, and other potential hazards to the rescuers. One burial can only be worsened when the rescuers themselves are harmed or incapacitated. You’ve already been training for this all season long, working on safe travel habits by recognizing potential avalanche terrain. Your beacon is essential to locating your buried friend. 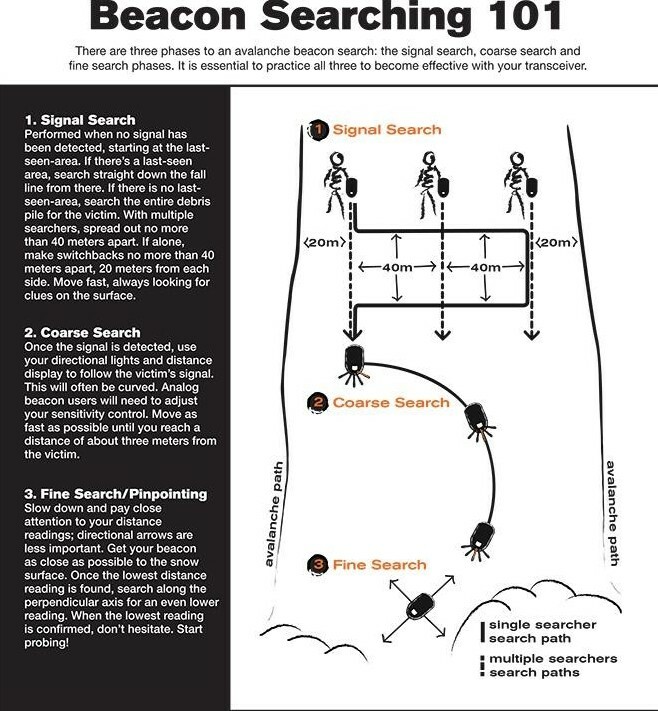 The beacon search should be fast and thorough. 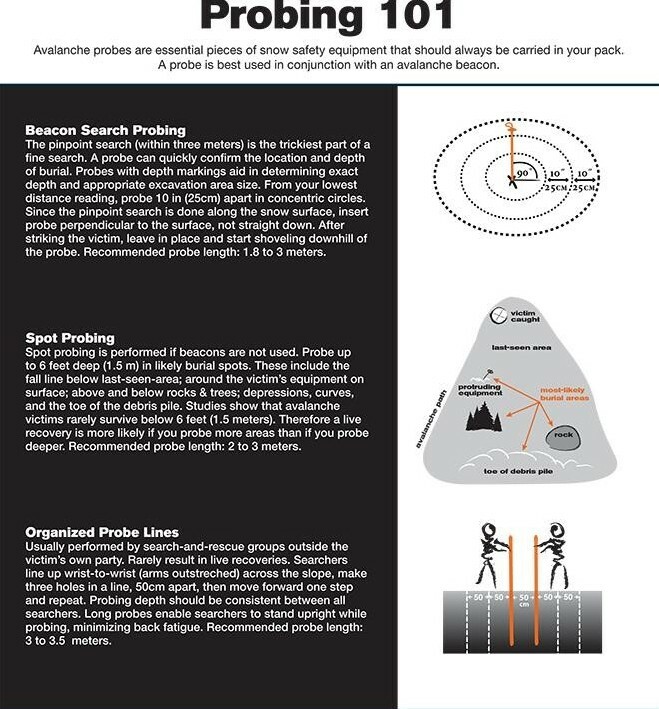 It is broken into three parts: the signal search, the coarse search, and the fine search ( BCA Beacon Searching 101 video). Remember to look up from your beacon throughout your searches to look for obvious clues (pieces of gear, clothing or a hand) on the surface of the snow. If spotted, pick up these clues to see if the buried person is attached then replace the equipment back on the snow to help clarify a possible line of travel. Know your beacon well. Train with it so that it becomes second nature and you have the ability to overcome its unique searching idiosyncrasies in case of an emergency. A great way to practice your beacon search is to skin, snowmachine or ride a lift to the free beacon park at the top of Whitefish Mountain Resort. Here you can select from up to eight different buried beacons to practice your skills. Another great training option is the backyard beer/Tupperware method because we’ve got SO much snow in the valley right now! After locating the lowest beacon signal, it’s time to pull out your probe. The probe is essential in accurately pinpointing a buried victim. Make sure you pull the cord all the way out and lock it in place to ensure you’ve got a functional tool. Probe first at the lowest noted beacon signal then outward from there in 10” spacing in concentric circles or a spiral pattern. Make sure your probing is perpendicular to the slope (BCA Probing 101 video). You need to be able to assemble your probe quickly with gloves on, so a great way to practice is by quick-drawing with your friends (Clint Eastwood western style) at the trailhead or in your backyard starting with your pack fully zipped up and strapped on as if you were headed out for the day. Now that you’ve pinpointed your buried friend, the hardest part begins - shoveling. First, note the depth on your probe then step downslope 1.5x the burial depth to begin digging into the location of your buried victim. Moving snow efficiently is the name of the game, so employ the “V-conveyor” method and rotate the lead shoveler regularly as they get tired (BCA’s Shoveling 101 video). Shoveling is the most physically challenging and time consuming part of a rescue, so learn to work together with your backcountry partners by practicing together in a non-emergency situation. A great time to practice is when you are digging a snow pit to assess snow stability (imagine someone is buried). 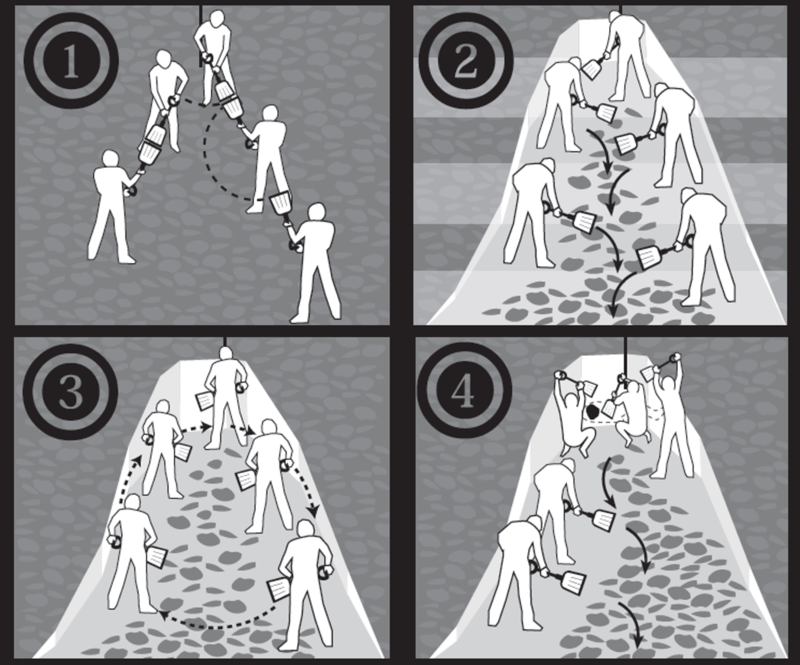 Figure 3: Images from Genswein and Eide (2008)) (http://arc.lib.montana.edu/snow-science/objects/P__8248.pdf). Now that you’ve unburied your friend, your party should be prepared to offer medical assistance and CPR. Have you checked your medical kit recently to make sure it is stocked up? Does anyone in your touring party have medical training? Once you’ve stabilized the buried victim, you have to get them out. Do you have a plan for extraction? Does someone outside of your group know where you are and expect a call or text message at a certain time? Is anyone carrying a device to call for help? Did you replace the batteries in your headlamp? Each of these medical and evacuation questions are much larger topics that are meant to encourage a bit of forethought in your backcountry planning process. Companion rescue is a big deal. Making sure your skills are up-to-snuff is a vital element of safe backcountry travel. Similarly, hold your partners and friends accountable to their own rescue skills and training because they might be saving you. If you feel like a refresher is in order, train at home with your friends having races for each element of a rescue scenario. 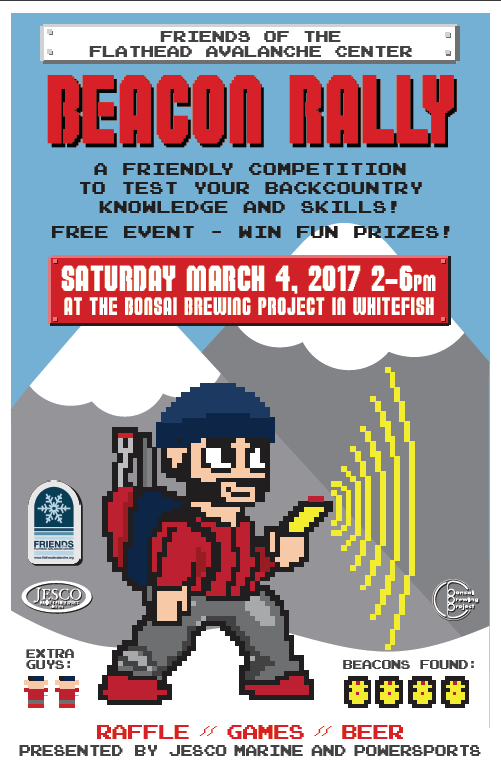 Or come join us at the Bonsai Beacon Rally this weekend, where you can win awesome raffle prizes and drink beer while improving your rescue skills! by Ted Steiner, Avalanche Safety Consultant, David Hamre & Associates, LLC. 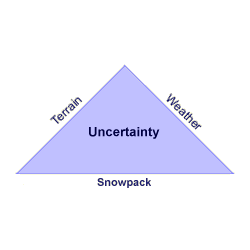 In this post, I will be covering my perspective on [Related image] preparedness (not necessarily what to carry with you) in the context of how to improve the chances of a successful backcountry endeavor into avalanche prone terrain while minimizing the opportunity for an accident to occur, and uncertainty as it relates to avalanche risk and ways we can reduce uncertainty and our chances of unintentionally triggering and/or being caught in an avalanche. If this is new information to you, I plead with you to read this blog post, hopefully learn from it, and be inspired to pursue formal avalanche education. I also ask that you hold off on any planned visits to avalanche prone backcountry until you have completed at least a formal Level 1 avalanche course that follows American Avalanche Association guidelines. If this is a review, thanks for taking the time to read this and refresh, but I challenge you to refresh or advance your avalanche safety skills by taking another avalanche course or at least make sure you are currently practicing thorough preparedness while assessing avalanche, snowpack, and weather conditions objectively. For those of you that frequent backcountry avalanche prone terrain, but feel what I am writing here is not relevant to you, I can only repeat what someone once told me; “…that snow is very forgiving until it isn’t.” Please educate yourself with a formal avalanche course, improve your objective-based assessment skills, and reduce your uncertainty as it relates to avalanche risk. If you have decided to pursue a particular endeavor into avalanche prone backcountry it is imperative you let someone (who will not be joining or going with you) know where you are going, who you are going with, and what the intended route of travel is. This is best communicated in writing or by text. It is also critical that your group has the experience and training necessary to accomplish whatever winter backcountry endeavor you are planning into avalanche prone terrain. Further, it is essential that all group members are trained in backcountry avalanche safety and familiar with heuristic traps and human factors that can come into play in the backcountry. In regards to more complex endeavors, it helps immensely that you are familiar with each member’s skillset and that all members are on the same level in regards to avalanche risk tolerance and risk management skills. Utilizing risk communication also provides a huge advantage when discussing group decision-making options particularly in complex terrain and in situations where concise risk reduction techniques need to be employed. Before heading out, utilize a “checklist” to ensure each group member is carrying necessary gear for a particular endeavor and that all members are carrying proper avalanche safety gear and trained in companion rescue. Also, remember Flathead Avalanche Center is not the ONLY awesome avalanche center out there. If you’re headed somewhere else to explore avalanche prone terrain other than in the FAC advisory area, always check the regional avalanche and mountain weather forecast for the area you are planning to visit. If you are headed to Canada, the Canadian Avalanche Centre has you covered in regards to fantastic avalanche safety training, information products, and avalanche bulletins. Visit Avalanche Canada. Europe also has numerous avalanche information centers in different countries and information regarding avalanche conditions is readily available online. If you and all group members have read the local avalanche forecast and have decided to pursue a particular endeavor into avalanche prone backcountry terrain, it is a logistical advantage to appoint a leader of the group before getting started. That way, if a critical decision needs to be made in regards to group safety or rescue, the leader can be immediately referenced to make that decision. Once in the field, it is the responsibility of all group members to intently focus attention on potential “Red Flags” related to objective indicators of snowpack instability (Obvious Clues). It is also key that if obvious signs of instability are observed that these observations are shared verbally with all members of the group and that the option of turning back or re-routing to non-avalanche prone terrain is always available. 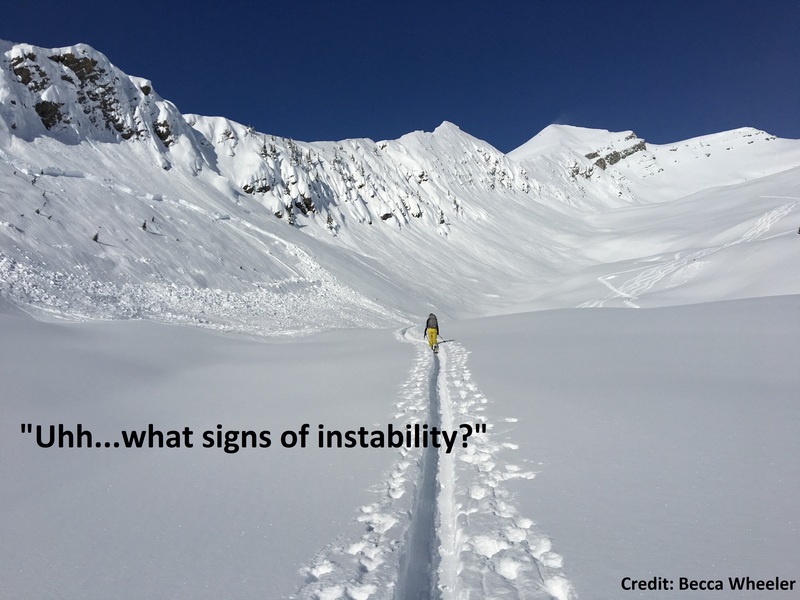 If no obvious clues related to instability are present, it is critical to examine (dig into) the existing snowpack to examine to evaluate structure and investigate instability. This examination needs to take place for at least the upper meter of snow, in a safe, yet representative location for the avalanche prone terrain you are planning to expose yourselves to (same aspect, similar slope angle, and similar starting zone elevation). Take time to look at the snowpack to objectively evaluate structure and stability. Always keep a close eye on the weather and, as stated earlier, although inclement weather may drive you to scratch a particular endeavor, at least you have made that call and have not tangled with an unexpected avalanche. However, if you’ve committed to a particular objective, constantly be evaluating, and discussing with your partners, how the weather variables may be affecting the existing snowpack structure and instability. What I have just shared here is a broad overview of preparedness tips and objective-based field observations that have assisted me, and many others, in being proactively prepared while reducing uncertainty when planning for and navigating backcountry avalanche prone terrain. If you are actively pursuing backcountry endeavors in avalanche prone terrain or are planning on getting into backcountry endeavors in avalanche country, I want to emphasize that you obtain formal avalanche education to Level 2 or higher, have solid partners as described in this blog, employ standardized snowpack assessment skills regularly, and utilize risk management/ communication practices. If you do this, you will greatly increase your preparedness for safe outings in avalanche prone terrain while substantially decreasing your degree of uncertainty related to avalanche risk. Be safe and thanks for reading my post, Ted. Ringing in the New Year in NW Montana brings many things to many people, including new beginnings in our physical and emotional lives. Oh, and wind slab. Lots of wind slab. As I bask in the the warmth of my laptop battery at 4:17 a.m. (it’s – 21 degrees F at my house), I scroll through my hit list of favorite weather sites and forecast models, and try to figure out how these changes might drive avalanche hazard in the coming days. Looking at the number of sites I visit and the volume of band width I absorb, I remark to my trusty avalanche rescue dog, Jett, “that’s a lot of information.” He pretends not to care. I recently traveled to the International Snow Science Workshop in Breckenridge, Colorado, along with over 1000 of our brothers and sisters-in-arms from around the globe. At this week long conference, the greatest minds in the avalanche world converge to present recent research, findings, and practical applications to help our understanding and make that world a safer place. An amazing experience, but a LOT of information. One presentation that really grabbed my attention was from a risk manager for CMH Heli-ski named Todd Guyn (https://www.adventure-journal.com/2016/10/10-common-missteps-of-avalanch...). He recapped the contributing factors leading to “close calls” and accidents in their operation and boiled it down to 10 Common Missteps of Avalanche Pros. I found it somewhat funny, given the conference environment, one of those missteps was information overload. We all feel the effects of information overload from time to time. The information train driven through Twitter, to-do lists, email, meetings, Facebook, PTA meetings, Snap Chat, Pinterest, instant messaging and more email can be enough to make the whirlwind of daily life paralyzing. The avalanche world is no different. 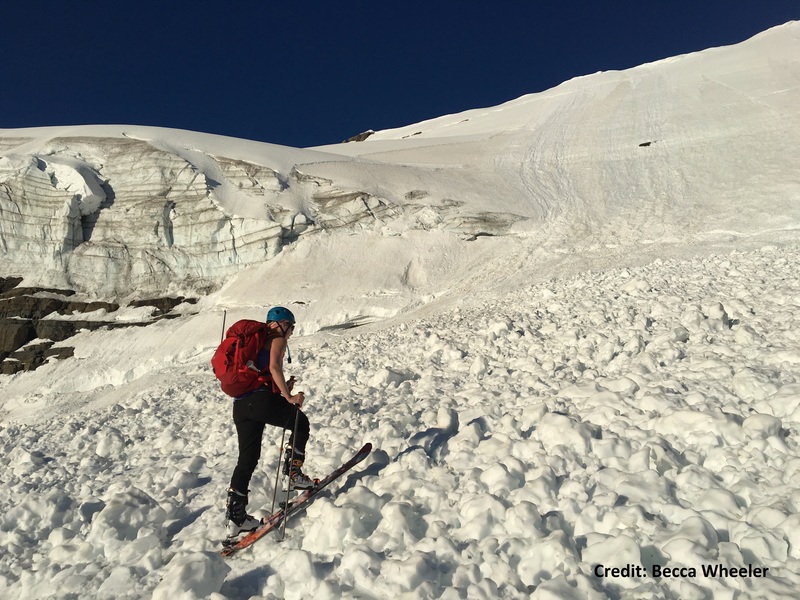 Avalanche hazard forecasting requires a significant commitment to observing, assimilating, integrating data from many sources and projecting how that will play out in the future. So, how can we mere mortals navigate the slippery slope of information without becoming buried in it? I posed the question to Jett, but he had little to add. So I typed “information overload strategies” into my favorite search engine and I was like a deer in the headlights. There is so much information on this subject (some of it contradictory to the other) that I quickly closed my laptop to avoid that terrain and opted for more caffeine. So how do we cope with information overload? Common themes do resurface while sifting through the strategies. Identify sources of information that are important to your end goal. For most of us and our lives in the backcountry, this means the local avalanche advisory. Filter incoming information to pinpoint what is useful and what you do not need. Build time in your routine to give the proper time to the information you need. Take the time to learn how to read the avalanche advisory. Being able to quickly move through danger ratings, avalanche problems and likelihood of avalanche trigger. 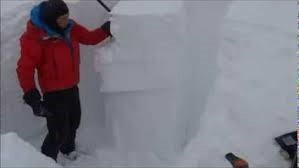 This is a great video from the National Avalanche Center to help start that navigation. 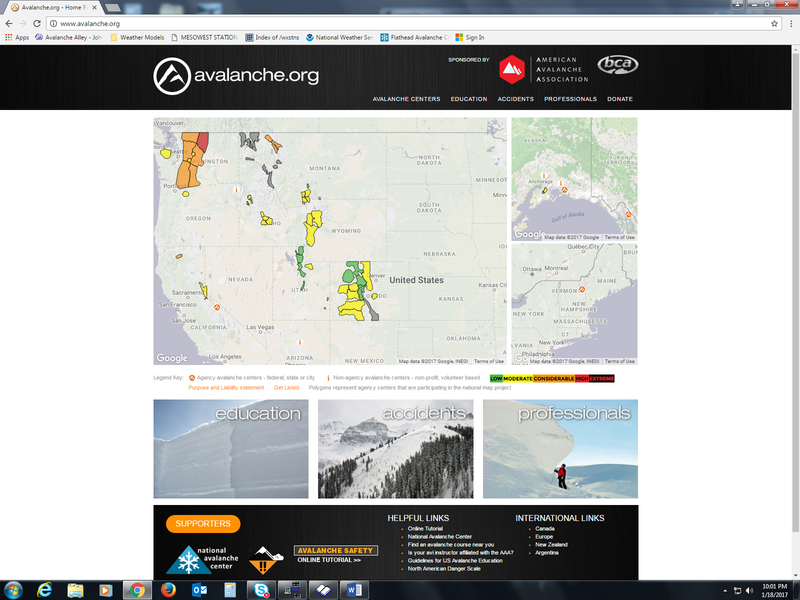 Make a plan for your season in the backcountry and check the avalanche advisory daily. This will help you find trends in snowpack conditions and help plan your next trip when the conditions are right. Don’t become so bogged down in information detail that decision making becomes impossible. Find the information you need, build a plan and don’t try to outsmart the avalanche problem. There are few absolutes in the avalanche world, but this rule always rings true. If avalanches are the problem, terrain choice is the answer. No matter how much snow safety jargon gets thrown at you, terrain management and good route finding can bring you home safe day in and day out. Strong winds out of the northeast and extremely cold temperatures of the last week have given us a mixed bag in our current snowpack. Hard wind slab can be stubborn in some locations and easily triggered in others. Weak faceted layers lurk deeper in the snowpack, formed during the arctic cold of mid-December. We have our collective eye on an incoming storm system for the beginning of next week that could produce significant snowfall and increased avalanche activity. It’s a little early to forecast precise snowfall amounts, but stay tuned to http://www.flatheadavalanche.org/ and we’ll give you the information to help you make good decisions while traveling in the backcountry. Stay safe out there! First, allow me to apologize to all of the Charles Dickens A Christmas Carol fans out there, but I am using it as an analogy later on. More importantly, from all of us at the Flathead Avalanche Center, we wish you a Happy New Year! 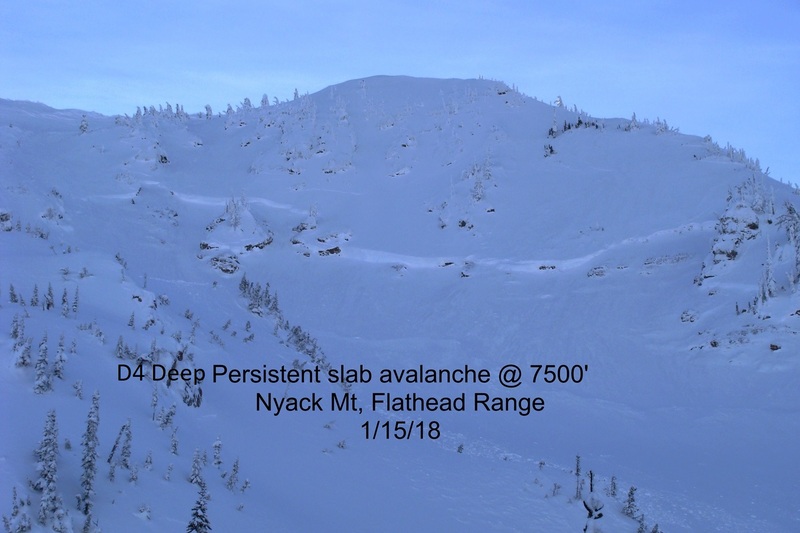 2016 was a great year for the Flathead Avalanche Center in many ways. 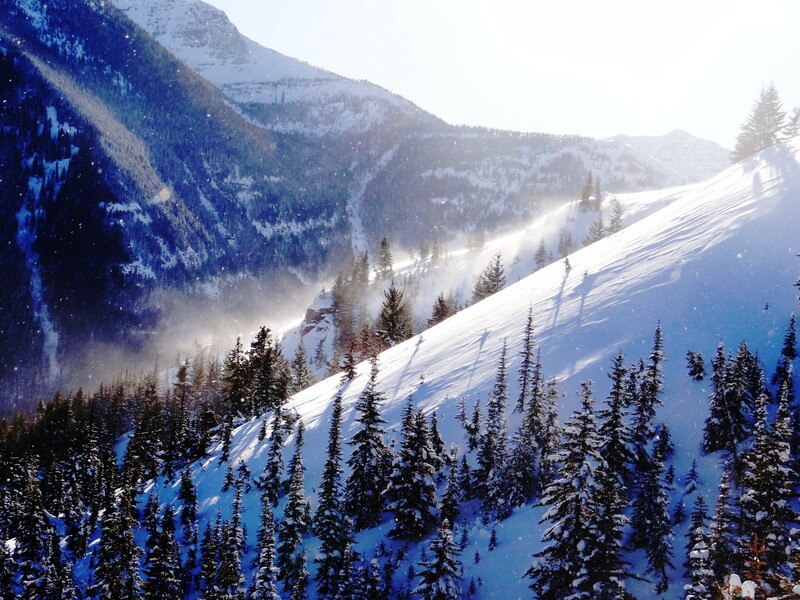 Just last year, we began issuing daily advisories for the first time in Northwest Montana, we've increased our avalanche education offerings, and we are receiving more observations from all of you. We want to thank you, the community, for your support along the way. We greatly appreciate it, and hope that we can continue to provide high quality products. But....I also want to use this opportunity to stand on the avalanche soapbox a bit. During this busy holiday season, many folks are out and about in the backcountry. More people in the backcountry sometimes translates to more encounters with avalanches, depending on conditions. So, let's keep it safe this weekend! December has been a great start to the winter. The snowpack is hovering around average as of 12/30/2016, but the snow quality has remained consistently good for the entire month. This is great for riding and skiing, but it also comes at a bit of a cost. We've "enjoyed" cooler temperatures for most of the month that allowed the snow to remain soft and light. Thus far, we haven't had to contend with the "R" word. However, the extended cold snap from December 13 to 19 caused weak snow to form at and near the snow surface. 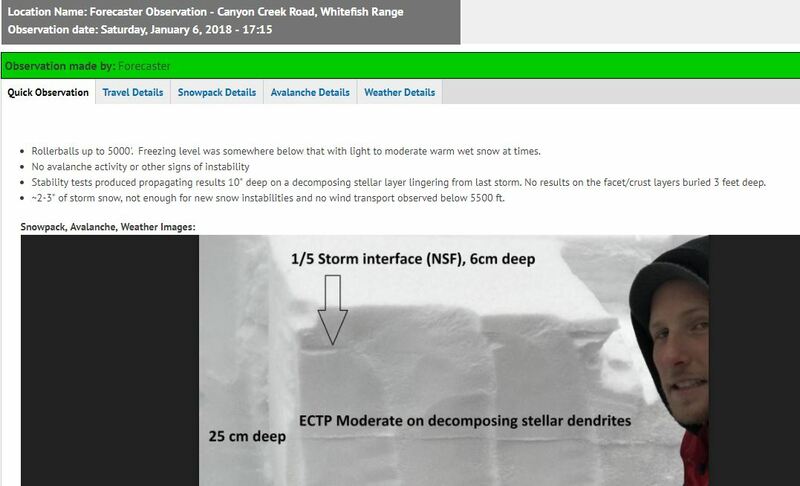 In areas with a more shallow snowpack (like southern Glacier National Park and areas closer to the Continental Divide), weak snow crystals near the ground grew larger. Then, we had a strong wind event and a slab formed over this weak snow. There were some avalanches, but, to our knowledge, most of them were confined to the new snow. The weaker snow appeared to be able to support that slab as well as the new snow that accumulated over the past week. So, while we have weak snow in the middle of the snowpack as well as near the ground in some places, we have yet to see avalanches breaking on these layers. Thus, while we have weak snow in our snowpack, we don't have a Persistent Slab problem....yet. So, we have weak snow in our snowpack. So what? Well, the first thing is to check the avalanche advisory for current observations and a daily danger rating. The advisory is a great way to begin your backcountry day. It is a starting point, and merely another tool in your avalanche toolbox. The hazard rating, while some times separated by mountain ranges if conditions dictate, covers four mountain ranges. That is a huge amount of complicated avalanche terrain, and avalanche forecasters are humans, too (read: they also make mistakes...I know, mind-blowing, right?) Anwyay, we currently have a wind slab problem. Strong winds over the past 5 days coupled with new snow nearly every day create a great recipe for wind slab avalanches. These wind slabs are found in obvious places like on leeward slopes near ridges, but also occur further downslope at mid-elevations in cross-loaded areas. Wind slabs are typically a "manageable" problem in that it is relatively straight forward to identify them or at least the terrain harboring these little monsters. 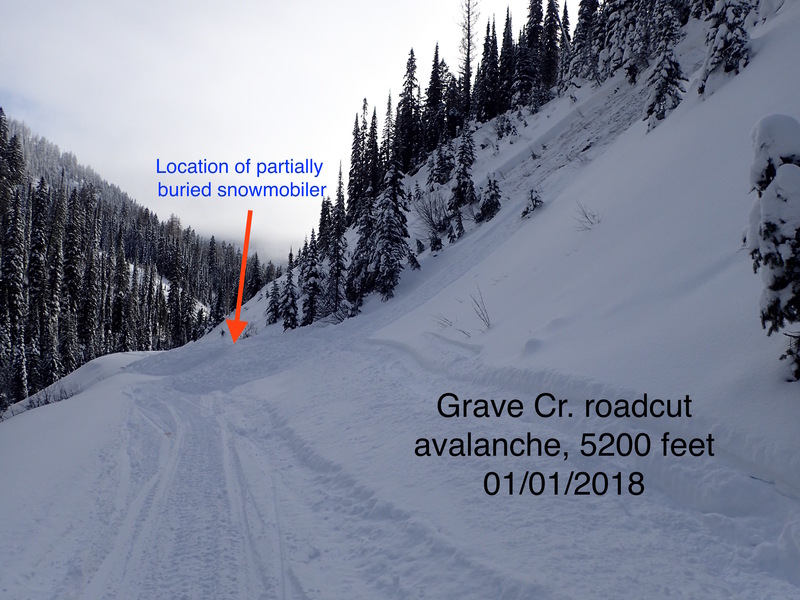 The recent skier-triggered avalanche in the Skook Chutes/Canyon Creek in the southern Whitefish Range is a good example. This terrain is very often cross-loaded by strong southwest winds, steep, and rocky. This makes it a perfect place to trigger a wind slab, but also, because the snowpack is often shallower here, a good spot to trigger deeper weak layers. Speaking of deeper weak layers, we could potentially be nearing the point where the weaker snow deeper in the snowpack may not be able to support much more above it. Sometimes, the snowpack begins to give us a heads up that we may be nearing the point of failure in the form of poor stability test results, but not always. Often, the transition from not a problem to a big problem happens rapidly, and typically during a storm. So, what do we do? First, truly read the avalanche danger rating and what it means. Too often, folks see a MODERATE danger (a yellow light...hey, let's slow down) and improperly treat it as a LOW danger (mostly green light, but avalanches can still occur). The MODERATE avalanche danger states it is still possible to trigger an avalanche. 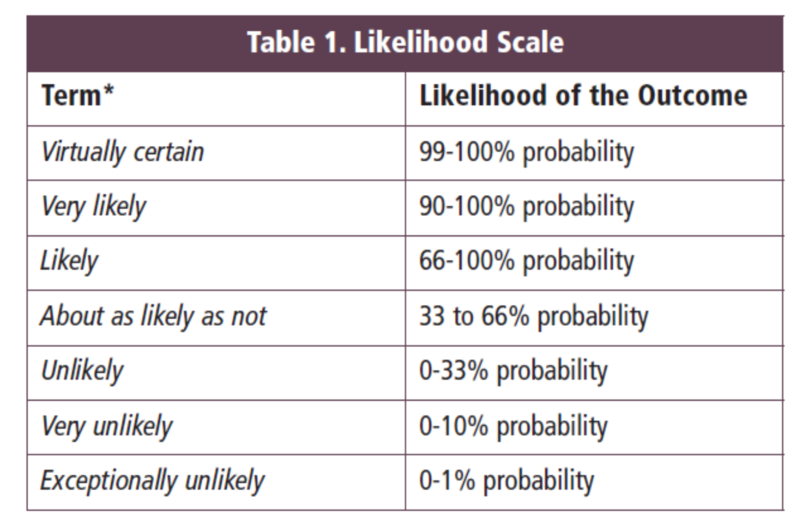 This implies up to a 66% probability of triggerinng an avalanche (Table 1). MODERATE is NOT the new LOW. Reproduced from: Guidance Note for Lead Authors of the IPCC Fifth Assessment Report on Consistent Treatment of Uncertainties. Would you ski or ride a slope that has odds of avalanching similar to flipping a coin? Simply because we don't see or receive reports of avalanches during MODERATE or even CONSIDERABLE rated days doesn't translate to stability. Hopefully, it means that folks are choosing terrain appropriate for the avalanche conditions and not triggering avalanches. Avalanche forecasters often use the travel advice associated with the danger rating when applying it (Figure 1). This is a good starting point, and truly take the travel advice and use it. For instance, CONSIDERABLE states "Dangerous avalanche conditions. Carefuly snowpack evaluation, cautious route-finding and conservative decision-making essential." To me, that entails, among other things, being really, really good at reading and choosing appropriate terrain, knowing the history of the snowpack, and evaluating the snowpack at every possible moment. It also means avoiding certain terrain depending on the avalanche problems. Remember, most avalanche fatalities occur during days rated as CONSIDERABLE. 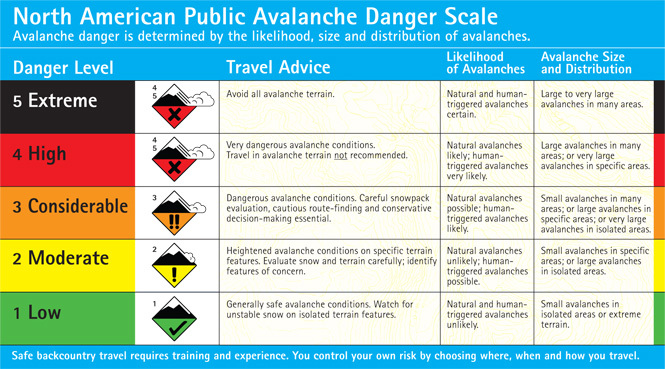 Figure 1: North American Public Avalanche Danger Scale. Second, do your homework and truly take a look at the snowpack. You don't need to be a snow scientist to dig a hole in the snow, poke it, and see if softer layers reside under harder layers. If you are uncertain about the stability of a slope, then move to more gentle (lower angled) terrain, and take an avalanche class. So, for now, dig into the snow, keep your avalanche eyeballs open, and let us know what you see out there. So, enjoy and have a safe and fun-filled New Year!